The average person will spend approximately a third of their life in bed. As we sleep, sweat, dead skin cells, hair, dust, and other contaminants, allergens, and debris is soaking into the fibers. Considering the accumulation of filth, it is an atrocity that people often neglect the need to clean the mattress though it is one of the essentials. Apart from washing the bedding once every two weeks, the mattress needs to be cleaned and manufacturers recommend the mattress gets cleaned by the owner every 2-3 months and by a professional 1-2 times a year. Maintaining a clean mattress contributes to improved health and sleeping habits as well as increases the lifespan while being kept in optimal condition. In an effort to help those wanting the optimal clean for their mattress in between professional cleanings, we at Leading Carpet Cleaning would like to offer an effective method in cleaning the mattress. 2) Neutralize and/or Prevent Odors. The sweat alone can cause the mattress to develop odors over time and add other factors, the likelihood only increases. To neutralize the smells and to also prevent any from occurring, blanket the surface of your mattress with baking soda and let it sit for 30 minutes or so. To add more fragrance, you can sift the baking soda with 5-10 drops of your favorite essential oils. Vacuum the mattress, ensuring all of the particles have been removed. Baking soda alone will not lift stains and in this step is only used to control odors. 3) Remove any Stain & Spots. In the event that your mattress bears any spots or stains, create a paste by adding drops of baking soda together. Once you have made a paste of fairly thick consistency, add a few pinches of salt. With a toothbrush, apply the paste directly to any spots and stains, gently working the paste into the blemish. Allow the mixture to sit for 30 minutes before vacuuming the remnants. If necessary, follow up with a damp cloth to remove the final residue. If any stubborn stains linger, combine 1 part mild liquid dishwashing soap and 2 parts hydrogen peroxide. Use a toothbrush to sponge the mixture to the stain, agitating it as you go and let it sit for 5 minutes. With a damp cloth, wipe the area clean. 4) Thoroughly Dry the Mattress. Before remaking your bed, the mattress needs to be fully dry. To expedite the process turn on the ceiling fan if applicable, set out portable fans and if the weather permits, open the window. There are a number of benefits of having your carpets professionally cleaned before the holidays. However there are those who are unsure if or what they should do in order to prepare to have their carpets professionally cleaned. After calling and scheduling a day for the cleaner to come, there are a number of ways you can prepare your home or the area to be cleaned. Leading Carpet Cleaning will share what prep work you can do to prepare your carpets to be cleaned. When you have scheduled a professional carpet cleaning service, you will want to remove all the furniture in the rooms or areas you want cleaned. Some services may offer to move furniture, however, it isn’t standard. If you want the entire carpet cleaned you will need to remove all the furniture and place it in another area. After removing all of the furniture or obstructions from off of the carpet, your next step is to thoroughly vacuum the floor. Most carpet cleaning services will vacuum up the floor before they begin cleaning the carpets. However, it helps to see the carpet more clearly if you vacuum the carpets first. The next step after you finish vacuuming up your carpets is to make note of those areas of concern. High traffic areas and stains need more attention than other areas. Sometimes they require pretreatments before the rest of the carpet gets clean. Making note of these areas and sharing them with your carpet cleaner will help insure those areas get treated correctly. Make sure to give the cleaner(s) plenty of space to both park and unload their equipment. Also make sure they have room to navigate to the different areas of the home. You don’t want to make it hard for them to get to the different areas you need cleaned. Additionally you will want them to have plenty of room to use their equipment properly. Any breakable items should be removed in the traffic areas the cleaner will be using. This just helps prevent any unforeseen accidents. Cleaners may also need access to your water spigot or faucets for their steam cleaners. Make sure to provide an area for them to add or rinse out water from their equipment. Some companies may bring their own water in large tanks. However not all carpet cleaners will supply their own water. Stay Out of Carpet Cleaners Way! When carpet cleaners arrive at the home, many customers like to find something to do to keep them occupied. When carpet cleaners are hard at work those left at home find themselves without any thing to do. When planning to have your carpets cleaned, which can take anywhere from an hour to several hours, depending on how many areas and the size of each room, the cleaners are cleaning, have something you can do that will occupy your time while you wait for the cleaners to finish their job. These are just suggestions to make your carpet cleaning service more worth your while. For those who want to have better results, follow these simple steps. If you have more questions on how you can prepare your carpet when hiring a professional carpet cleaner, contact Leading Carpet Cleaning. We will be happy to provide you with answers to your questions, and give you clean and renewed carpets. Contact Leading Carpet Cleaning today! The carpet in your house is a big investment. It is one that you don’t want to have to replace due to damage any sooner than absolutely necessary. 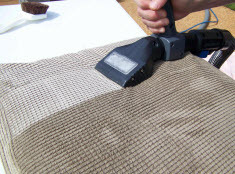 There are several steps you can take to help safeguard your carpet and extend its life. Leading Carpet Cleaning is here to share some simple tips that can help you get the most out of your carpet. One of the best ways to keep your carpet in good condition is proper maintenance. Vacuuming your carpet on a regular basis will keep the dirt and debris off the fibers and unable to cause any damage to them. To effectively clean your carpet, you should be vacuuming 2-3 times every week. When vacuuming your carpet, take your time. Slow steady passes on the carpet will allow the machine to work efficiently and thoroughly. Another vacuuming tips includes vacuuming in different directions rather than the same direction and pattern each time you make a pass. There will be spills and stains that happen on your carpet no matter how careful you are. You should be spot cleaning whenever you notice any spills take place. Working quickly is necessary in avoiding any damage to the fibers of your carpet. When the layout of your room never changes, people will likely walk on the same pathways throughout your home. Changing up the furniture will change the traffic patterns as well. This will help your carpet to wear evenly without leaving behind heavy worn trails throughout. In all the areas of your home that receive the most traffic, you should use area rugs or high traffic floor mats to keep your carpet safe. It is especially important to have a rug that is the right size as you walk in any entrances to your home. There is a good amount of dirt and debris that resides on the bottom of shoes and should be removed by a rug before making its way to your carpet. The better option would be to remove any shoes upon entering your home to avoid this grime, but a rug is a must. One of the biggest mistakes make when it comes to their carpet maintenance is skipping the professional carpet cleanings. You may think you can effectively clean your carpet on your own, but it is likely that you don’t have the right tools and equipment to get them truly clean like the professionals at Leading Carpet Cleaning do. Our industrial strength cleaning equipment will be able to lift even the toughest stains and leave your carpets in like new condition. When you skip these cleanings, you may be damaging your carpet in the process. Your carpet needs to be professionally cleaned twice a year to properly maintain and safeguard it. You will find that your carpet lasts much longer when you take advantage of the deep clean we have to offer you. Call us today! One of the parts of the winter months that take a toll on the cleanliness of your home is mud. The mud is a bigger problem in this part of the year for two real reasons. One is that the winter is colder and that is not conducive to grass growing. That means that grass is not there and that means that the dirt is exposed. Now add to the water and or moisture to the dirt and that makes mud. The mud is a problem when you, your guests or your pets walk in it and then walk into your house. The mud will often come with you and end up on your floors and upholstery. The important thing that you need to know about mud is that it has to be cleaned properly so that it does not spread and increase in size. If you happen to use the same technique to clean mud that you would to clean chewed up gum the problem would not get better. You also need to have knowledge on the best ways to clean different parts of your floor from mud. How to Clean Muddy Footprints on Carpet: If you end up with mud on your carpet you need to clean it in a particular order. The first thing you need to do is to allow the mud to dry out all the way before you can do anything. When the mud is wet you are trying to combat moisture as well as the dirt. The dirt is easier to work with when it is alone. After the water has dried out you can use a brush to break apart the compacted dirt that is left over. You need to break it so that you can vacuum up the remnants after it has been broken. You may need to work on the area a little at a time so that the dirt is not able to expand further. After you have removed the dirt and vacuumed it up you need to treat the rest of the area. Mix water as well as dish detergent so that you can use to spot clean the area. Spray the area then use a clean cloth to dab at the area. This should leave the carpet looking clean and mud free. How to Remove Mud from Tile & Grout: The other area that you might have a problem with mud getting on is tile. The tile floors exist in entry areas, kitchens and dining rooms. When you have mud on these areas you can treat it differently than you can when it has gotten on the carpet. You want to use a broom and dustpan to pick up as much of the debris as possible. Don’t sweep the mud in large areas and try to keep it close by so that it won’t spread out. 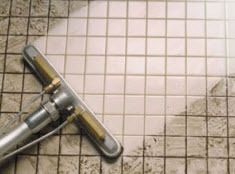 You then need to clean the tile with whatever cleaning solution that you use on your floors. This is often water that is mixed with vinegar to clean the floors after the mud has been swept up. Floor Cleaning & More in Orange, Santa Ana, Rancho Cucamonga, Anaheim, Whittier, Riverside, Chino & Fullerton California. 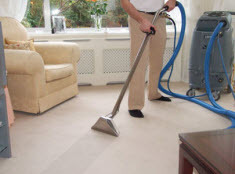 Leading Carpet Cleaning offers cleaning services to care for your floors and fabric furniture. Contact us today?